(Beijing, 17 June 2015) In order to improve the cooperation in the field of education, the delegation of the Belgrade Business School led by Director prof. PhD Dj. 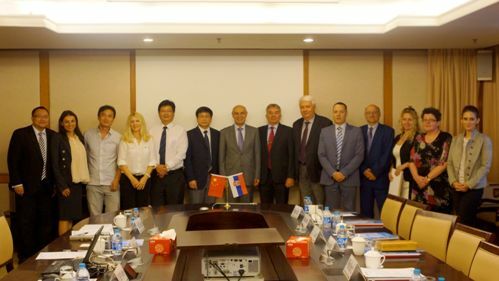 Djurovic visited the People's Republic of China and on 16 June 2015 had a meeting at the East China Normal University in Shanghai, with the President of the University prof. Chen Qun. After the meeting, Dj. Djurovic and Chen Qun signed a Cooperation agreement between ECNU and BBS in the areas of exchange of delegations, scientific exchange, exchange of professors and students, joint research etc. Along with the delegation of the BBS, Ambassador of the Republic of Serbia to the People's Republic of China M. Bačević, third secretary in the Embassy M. Kuzmanović and Consul Gerant of the Consulate General of the Republic of Serbia in Shanghai Z. Subotić attended the meeting.